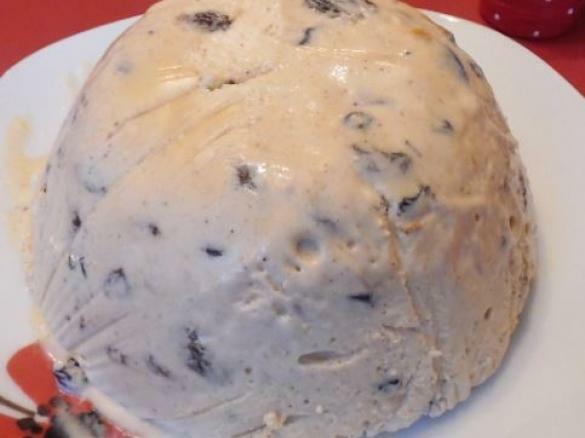 ice cream christmas pudding by mrswingnut. A Thermomix <sup>®</sup> recipe in the category Desserts & sweets on www.recipecommunity.com.au, the Thermomix <sup>®</sup> Community. line 2 x i1 litre pudding basins with clingfilm. place 100g sugar in TM 10secs/ speed10. scrap down sides with spatula. Insert butterfly whisk and add 4 egg whites and pinch of salt. whisk for 5mins/speed3.5 or untill stiff. set aside in a bowl to use later and remove butterfly whisk. place cream in TM 1min/ speed 3 or until it forms soft peaks. Be careful not to overbeat it. Scrape down sides with spatula. Add egg yolks, meringue and mincemeat 2 mins/ reverse/ speed 3 . using spatula in lid if needed. Pour into pudding basins, cover with clingfilm and freeze over night. Meanwhile make the toffee sauce as follows. Put 75g white sugar and 50g Muscovado sugar in Tm 10 secs/ speed 10. Add butter and golden syrup 5 mins/80 degrees/speed 4. Add evaporated milk 10 secs/ speed 3. Serve sauce hot or cold. 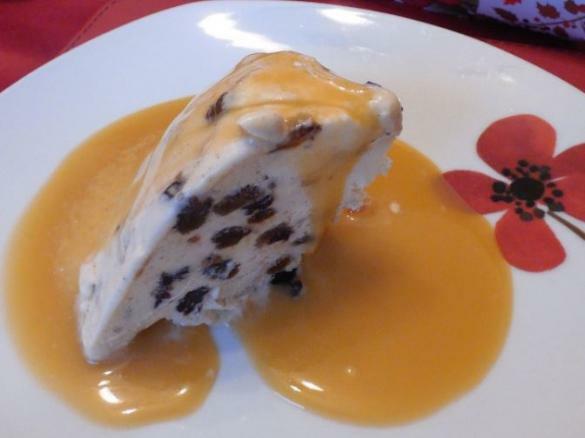 Ice cream pudding can be frozen for up to one month and toffee sauce will keep in the frige for one month. I usually freeze half the sauce to use later on.